Reading on a Rainy Day: The Sunday Salon: Survived the first week of work this year! The Sunday Salon: Survived the first week of work this year! Good morning fellow readers! It's 10.40 in the morning as I type up this post. The husband and I (or rather just I) took the liberty of sleeping in this morning. I know I'll pay for it tomorrow (Mondays are always extremely sleepy days for me), but that's tomorrow's news. For those of you who went back to work this past week, how did it ago? I had a very busy week, as only first weeks after long vacations/holidays can be. That's certainly better than a slow boring week. This week should be a lot tamer and smoother, hopefully. Today, I would like to get some chores out of the way. I have been woefully neglecting them for awhile. I have a chunk of magazines to get rid of. The master bedroom is becoming a catch-all for things that I am too lazy to put away, so those need to be sorted. I just finished cleaning up the kitchen this morning, so that's one task done. Whoo! Later in the day, the husband and I are planning to start at our new gym, so here's fingers crossed that this time, the gym will stick. We'd much rather step outside and walk with our dog, but with the freezing temperatures we had this entire week, I feel sick as a slug and would like to get some exercise. I will have to take it a little easier however, because I may or may not have sprained my ankle yesterday. It is hurting somewhat, but it's not too bad that I cannot walk. This week, I started watching Friends on Netflix. Would you believe that I had never watched it before? I always need subtitles to watch anything, not because I can't understand, but because my hearing isn't the best. So after watching some of the later episodes with the husband, I decided to just go ahead and start watching it from the beginning. So far, I am loving it, and totally grateful for subtitles and Netflix. I didn't get much reading done this week. I am in that phase where I am trying to decide what to read next without really deciding. Last night, I came across a news article about the TV version of The Book of Negroes, and decided instantly that I want to read that book. 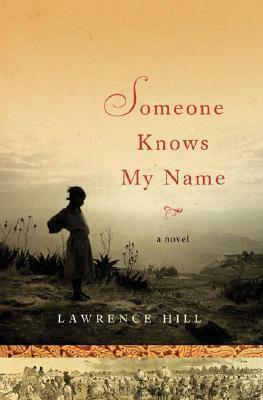 Luckily, my best friends had given me the US version of the book, Someone Knows my Name, as a birthday present some years back, so I am hoping to settle down with that book sometime today. Oh, I love it when I want to read the most random of books, and happen to have that book with me too. I'm glad the work week went well. I've never watched Friends either. My first week back was easy. It's still winter break at the college so not much to do for me (great way to ease back). It is so cold here too and for another week as well. Stay warm and good luck with the new gym. Friends! I am totally addicted - again. I did watch it when it was first on, but haven't seen it in years and am already almost through Season 1. I've never watched Friends, either! There are a number of series on Netflix that I want to get to. I slept in today as well, and now even though it's dark out I feel like it should be much earlier than it is! Aw, Friends! Aw, how fun to be watching it for the first time! I watched it for the first time when I was spending a year in England, because British people love that show SO MUCH and my flatmates absolutely would not stop pressuring me to watch it. And they were right. It's so fun and dear. I feel utterly calm and happy when I'm watching it. Your first time with Friends?? Wow. There are so many classic lines and catch phrases that have come out of that show, I hope you enjoy discovering some of them. Like freezer books! Friends is just so good! I love that I am watching it for the first time. I can already see that I will probably watch it multiple times. Now I don't feel too bad about not having watched Friends until now. It is a pretty great show though and I'm loving it! I love those first weeks back at school/college when students are still on break - it's so quiet and peaceful and the buses always have available seats on them. Oh yay! I also just finished the first Season last week and started with the second season a couple of days ago. It's becoming my favorite thing every evening. It bugs me that the evenings look so dark, almost like it is already night-time. It will be nicer if Spring came in early this time. It IS such a fun and dear show! I just love it so far and am trying to watch just 2-3 episodes a day so that I can make the fun last. It's just too good! I remember watching my cousin watch Friends and wishing that I could watch it too. At that time, my parents weren't keen on letting me watch any TV shows. So there went that chance. Still, I am sure I wouldn't have heard properly either if I had watched the show then. Busy but reading is good! Here, it is busy but watching TV! I wish it was reading instead. So far, it is just the most amazing show I watched. I don't usually watch sitcoms beyond the first few episodes. Something about feeling repetitive. But this one is too good! How was the gym? I have been terrible about getting back into my regular exercise routine. I was sick, my daughter was sick, I need sleep because everyone's sick . . . I really need to start again soon. Once I do, it'll be easier to motivate myself to get out of bed early again. Happy new year! I didn't even know there was a U.S. version of Book of Negroes! Look forward to your review. "Friends" is great, isn't it? I loved it. I hope you enjoy it. I've nominated you for the One Lovely Blog Award. Congrats! So far, the gym has been happening! I am so happy about that, because both the husband and I are not good at holding on to fitness goals. *touch wood* Hope that this time, it actually works, and I believe it will. Friends is just brilliant! I am so happy to be watching it for the first time! I've heard good things about Someone Knows My Name. Can't wait to hear your thoughts! I haven't gone back to it since the first day. Hope to read it soon!